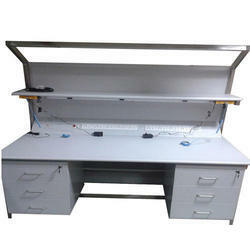 With through knowledge of this domain, our firm is engaged in manufacturing, supplying and exporting ESD Workstation. It is manufactured by our employees using qualitative mild steel welded pipe and modular aluminium table. We pay optimum attention to the expectations of our clients while manufacturing the offered workstation. We are the leading organization in the industry to provide our clients the best quality array of ESD Workstation Monitor Single Operator. 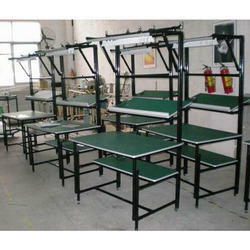 We manufacture ESD Safe Work tables as per customer requirements. Recommended Application Areas Include Units Manufacturing Sensitive Electronic Equipments, Integrated Circuits, Computer Rooms And E.D.P.Units, Radar Stations, Catscan Centres, Operation Theatres, Research Laboratories, Quality Control Labs, Control Rooms And Telephone Exchanges, Etc. Sturdy Worktable with ESD Kit to ensure your electrical operations work is enhanced. ESD Kit comprises of ESD Mat, 4 buttons and wristband.